Maintain market perform with an unchanged target price (TP) of RM1.55: Yesterday, Sunway Bhd announced that their joint-venture with partner Hoi Hup Realty Pte Ltd, was awarded a land parcel measuring approximately 4.46 acres (1.80ha) at Canberra Link (Lot 4018N, MK19), Sembawang, Singapore for a 99-year lease term for executive condominium housing development at S$271 million or RM817.2 million. The tender bid of S$271 million represents a 4.7% premium compared to the second highest bidder. This marks the second landbank replenishment in 2018 after Brookvale Park in February 2018. We laud Sunway for its land banking activity in Singapore as they are one of the few developers in town that is landbanking instead of selling land as seen in other developers weathering the weak property sentiment in Malaysia. The land in Sembawang with a plot ratio of 2.5 times is earmarked for the development of an executive condo (around 500 units) with an estimated gross development value (GDV) of S$500 million and management is only targeting to launch in 2020. We are relatively comfortable with Sunway’s move in Singapore as most of its new projects are executive condos, whose demand appears to be more resilient as it falls under the Housing Development Board (HDB) scheme. Based on its effective stake of 35%, Sunway is only required to fork out S$94.9 million to fund the above-mentioned acquisition and its net gearing is expected to inch up to 0.51 times from 0.48 times (as of 2QFY18) which is still within our comfortable levels of 0.5-0.6 times. 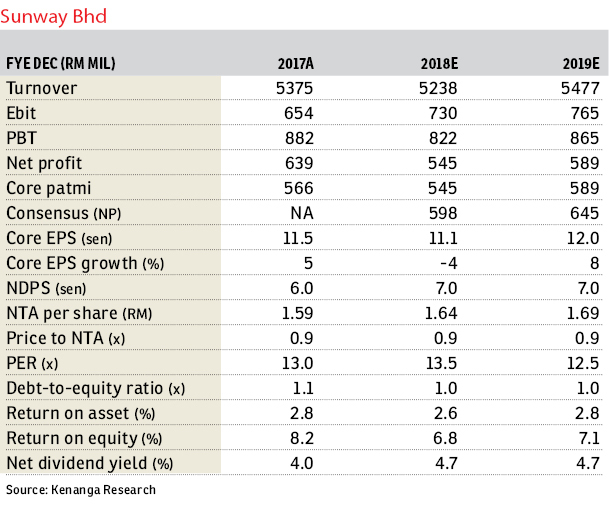 Historically, the highest level that Sunway had geared up was 0.57 times in 2012 and we are not too worried about its balance sheet as they could easily de-gear by injecting some of the matured investment assets into Sunway Real Estate Investment Trust. We believe Sunway is on track to meet management and our sales targets of RM1.3 billion and RM1.4 billion, respectively, due to the encouraging take-up rates in both local and overseas project. To recap, its Singapore project that is Rivercove received full take-up upon its launching in April 2018, while its local project, that is Geolake and Citrine Lakehomes’ sales and bookings are currently at 60-70%. Property unbilled sales of RM1.5 billion with one-year visibility and a vigorous outstanding order book of RM5.8 billion provide two to three years’ visibility. There are no changes to our FY18-19E earnings, as the launch of the project will only take place earliest by 2020, and we only expect contribution to kick in by 2022/2023 as they can only recognise the profit upon completion of the project. We reiterate our “market perform” call with no changes to our sum of parts-driven TP of RM1.55 as the impact from the landbank replenishment is seen to be minimal. Currently, we are comfortable with our valuation parameters as follow applied property revalued net asset value discount of 64% that is close to the sector average of 68%; premium valuation of 25.0 times forward price earnings ration (PER) for its healthcare division, and 12.0 times FY19E PER for its construction division, which is in line with our big-caps’ range of 12-14 times. This article first appeared in The Edge Financial Daily, on Sept 14, 2018.